This may seem like a strange highlight of my Australian life, but coming from Ireland where brunch simply doesn’t exist, I believe it has been one of the greatest introductions to my life. In Ireland breakfast is usually in the form of a cereal that tends to be about as tasty as the box it comes in, or toast. Typically however, every day you have your set breakfast early in the morning before work or school; your set lunch at midday, and brunch is unheard of. Although it took some time to become accustomed to eating breakfast styled dishes at 11am or 12pm, brunch has slowly but surly become my favourite thing about living in Australia. This is not merely a meal time; this is a time to meet up and socialise with friends over smoothies and coffees at weekends; gossip between mouthfuls of oozing eggs, and read our newspapers and books while chomping down on slices of assorted fruit breads. On discovering this new love, I set out on a mission to find the spots around Sydney to chow down on the best brunch. 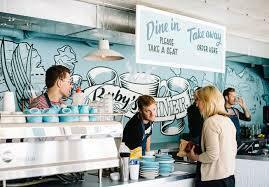 This, my readers, brings us to Ruby’s Diner in Bronte, undoubtedly the best brunch spot in the East in my opinion. 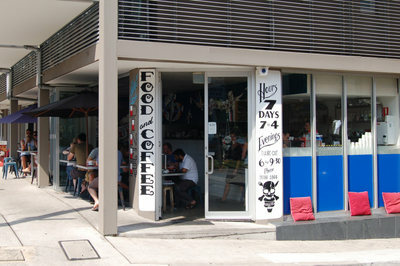 Located on Bronte Road, it is centered between Randwick, Bronte, Waverley and Bondi Junction. I highly recommend walking beforehand or afterwards; taking a stroll around beautiful Queens Park or Centennial Park, but you can usually find some close by street parking too. Hard to miss with its eye-catching blue graffiti feature walls, it has outdoor and indoor seating options, and fantastic comfortable diner style interiors. Ruby’s is usually swarmed with people at the weekends, and on a recent visit there was a 30 minute wait time on food; but if you have the patience it is always worth it. They have also had some recent renovations to expand (that has to say something about the popularity) so you can usually be seated immediately. They seem to mainly have long serving staff, which is great when ordering, although not overly friendly. The staff do know their stuff and are quick to serve and take orders. Now let’s talk the food. They have an original menu and fantastic options for those looking for gluten free, vegetarian or healthier options. With bread coming from an organic bakery and coffee supplied by Sydney brewers Single Origin; their produce is local, fresh, and of the best quality. With lots of choice from poached eggs, bacon and lots of sides, to the famous Ruby’s BLAT; home made beans and aioli; five grain bircher muesli with seasonal poached fruits; raw breakfast salad; home made super food muffins, and delicious smoothies and juices - you'll be hard set to know what to pick. The raw breakfast salad with poached eggs, a yogurt dressing and toast gets me every time. It is so delicious, filling yet super healthy, and a fantastic example of bringing exactly the right flavours together on a plate. This dish is what made me fall in love with brunch; consisting of kale, almonds, celery, broccoli, avocado, coriander, chilli and soft feta topped with two perfectly cooked poached eggs. The toast is optional, but I just love topping my own gluten free slices with the salad and eggs for a mouthful worth crawling out of bed for every Saturday. Smoothies include my favourite Monkey Magic which is a banana, cinnamon, almond milk, honey and chia seeds option; or another option Peanut Butter & Jam made from mixed berries, oats, peanut butter, ice and milk. There are organic fizzy drinks and natural juices, or I highly recommend a milkshake made from their own syrup. Although I am not a coffee drinker, my accompanists confirm that the coffee is the best around, and I am a huge fan of their herbal blends with a naturopathic twist. If you are feeling like it is too late for breakfast, there is a huge selection of salads and sandwiches including a slow roast lamb sandwich with quinoa tabbouleh and hummus, or I highly recommend going for what may be Sydney’s tastiest burger. This comes in the form of a juicy beef burger with vintage cheddar melted the proper way (on the burger on the grill), beetroot relish, tangy pickle and a hearty fresh bun that brings it all together. On the side you get a handful of smashed, garlic crusted baby potatoes, and it’s best all washed down with one of those earlier described shakes. Full of character, a menu that will have something for everyone; food that absolutely never lets you down, and for coffee that never fails to hit the spot; Ruby's Diner is my pick for best brunch spot in the Eastern Suburbs. I urge you all to try it out, and just try and stop yourself from grabbing a take away freshly made muffin or cookie on the way out. 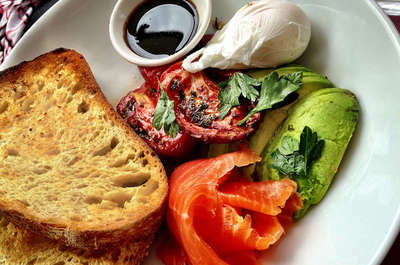 Why: Eat in or take away the best brunch in the Eastern Suburbs.